Recently I’ve seen some fresh(ish) discussion of that bridge where dogs are said to commit suicide. Now, there’s no doubt that bridges can be uncanny places, as the lore of Crybaby Bridges, Screaming Mimi Bridges, and trolls attests. Add in the Devil as bridge-builder, taking his fee in the soul of the first living thing to cross, and people entombed alive in bridges to ensure that the structure will stand, and you’ve got an excellent excuse for taking the long way round. Here is a letter which seems to be worth giving in full, for the account is so circumstantial and at the same time so different from many of the stories that are told along these lines. It is signed in the original by a man who has been engaged in active professional work in Colorado Springs for the past 10 years. Ever since I read your request asking for personal experiences of seemingly inexplicable phenomena, I have been debating in my own mind whether you would consider an experience of mine worthy of attention. I have never told it to very many people, for it is not agreeable to meet that look of contemptuous incredulity which is assumed by many superior people as a cloak for their ignorance of such matters. But it is something that I have never been able to explain, nor has anyone ever been able to help me in arriving at any explanation. And I have always wanted to know WHAT it was that produced the peculiar effect or influence that I experienced. So I have decided to write it out and send it in to you. If you think it worth while you may publish it, but for reasons which are perfectly obvious I do not wish my name used in connection with it. If, in your judgment, the incident is too slight to be worthy of space I should be glad to have my letter returned, for I want to submit it to some one who has had experience in these matters. The experience which I speak of happened several years ago, but not so long ago but that the memory of it is fresh in mind. To all essential facts I would make oath before a notary. I have just given this incident to show that she was not excitable. I told her a ghost story one evening that had been told me at first hand by a reliable person and was ridiculed for attaching any belief to it. When I persisted in saying that I thought it might be true, she was a little contemptuous and considerably puzzled. I never ventured again to make reference to anything of the sort. Indeed, at that time I gave very little attention to anything of the kind myself. One evening we took a walk on a quiet road near the outskirts of the city. We stopped for a moment on a bridge crossing a shallow stream. It was a cloudy night, but moonlight penetrated the clouds so that it was not dark. We sat on one railing of the bridge, facing the center, and could distinctly see entirely across the bridge to the other railing. There had been nothing in the conversation to excite the imagination or nervousness in any form. It may seem foolish to tell you what happened, for it was such a little thing. But just remember that we were both of us well out of our teens and neither of us morbid or imaginative. As we sat there talking we heard a sound coming down the road, approaching the bridge. It was not a team of any kind, but sounded more like a good sized dog trotting along. Then the noise sounded on the bride, nearing us, passing in front of us, receding in the opposite direction from which it came and ceasing after it left the bridge. “WHAT was that?” was the startled whisper of my companion. We had neither of us seen anything whatever, although both heard this sound pass in front of us on the bridge, every part of which was distinctly visible. We looked at each other in utter bewilderment. The noise had been light, yet sharp, in the cadence of a galloping horse, yet not the heavy tread of a horse; in volume the sound might have been made by a medium sized dog, but the sound was not such as would have been made by a soft-footed animal, but sharp and distinct, as sharp as the sound made by drumming on wood with the finger nails. Yet the floor of the bridge was covered with a considerable coating of light dust. That is all of my story. I searched along the bank of the stream, trying to find some trace of camping party or tramps or any sign of any disturbance of the bushes. Not a thing could I find. I know it’s not much of a story, but it is every word of it true. The sound of a “medium sized dog” seems inadequate to trigger the witnesses’ dire sensations, which I suppose we could file under a subset of “woodland panic,” less the woodland. And what of the sound “as sharp as the sound made by drumming on wood with the finger nails”? The pitter-patter of tiny devilish hooves? I assume his reference to the dust on the bridge means that they found no footprints of dog, horse, or Mr. Splitfoot. I wish I knew what “eastern university” he was attending to narrow down the location. 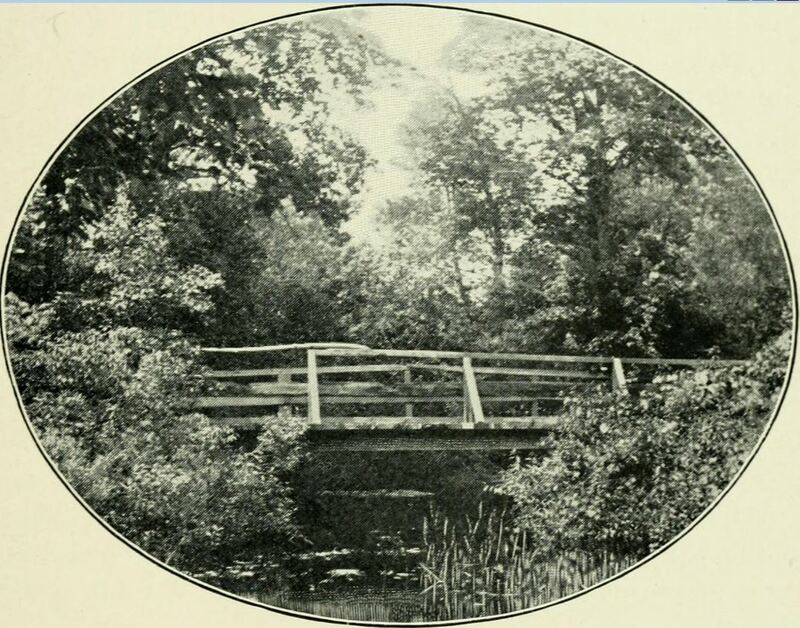 The illustration shows the haunted Country Bridge near Haverhill, Massachusetts. John Greenleaf Whittier as a child was terrified of the bridge. Country Bridge had the reputation of being haunted, when Whittier was a boy, and several of his early uncollected poems refer to this fact. No one who could avoid it ventured over it after dark. He told me that once he determined to swallow his fears and brave the danger. He approached whistling to keep his courage up, but a panic seized him, and he turned and ran home without daring to look behind. Hah! Thanks, Floodmouse. Good work! I’ll let you visit the archives to confirm that….